Editing Employee Details from the Staff List is the easiest way for admin users to implement changes to these details. The Staff List features a dynamic search to make multiple edits quicker. In the Staff list, select the Employee to be edited. When the Employee Detail form appears, click the Edit icon. 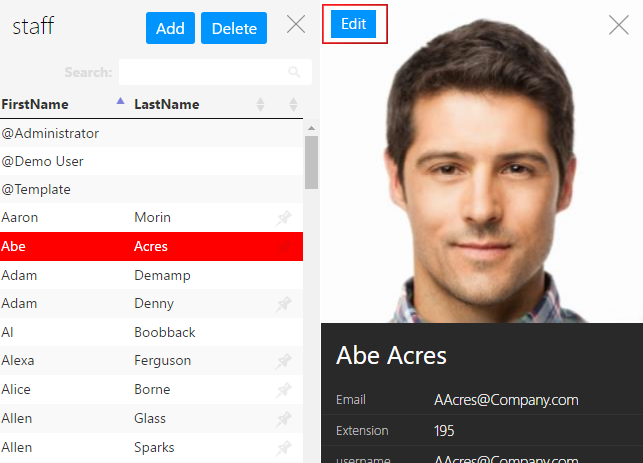 Edit any Employee Details fields in the panel by selecting the field. Enter the employee’s first name and last name, and make sure that they are assigned to the correct Security Group. Click the Save icon to save any changes.